According to research firm IDC, the Apple Watch will lead the smartwatch category to strong growth over the next few years. IDC sees watchOS finishing this year with 13 million units shipped, good enough for a leading 61.3% of the global smartwatch market. 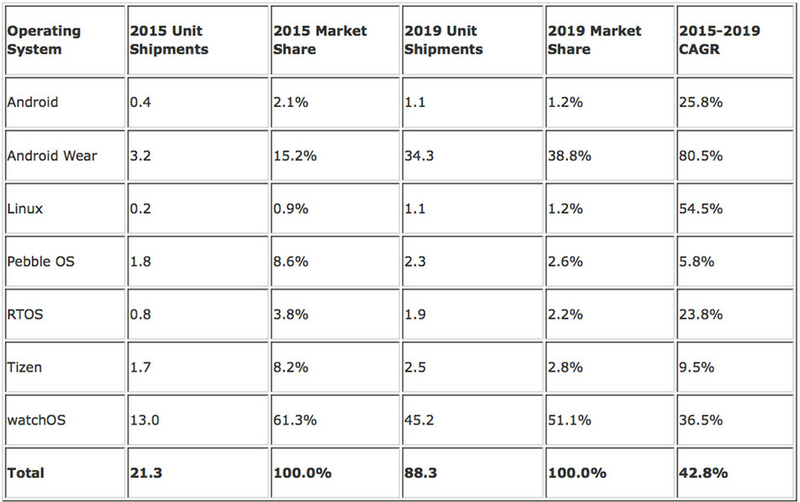 Android Wear will be second with 3.2 million units delivered this year, translating into a 15.2% share. Pebble will have 1.8 million units in transit, just edging out the 1.7 million Tizen powered smartwatches that will be shipped this year. 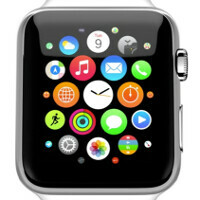 IDC sees watchOS benefiting from Apple's large fan base and expanding selection of apps. The research firm says that "very quickly, watchOS has become the measuring stick against which other smartwatches and platforms are compared. While there is much room for improvement and additional features, there is enough momentum to keep it ahead of the rest of the market." According to IDC, from 2015 to 2019 watchOS will grow at a compounded rate of 36.5%. That will give it 51.1% of the global smartwatch market at the end of that time period. By 2019, Apple will be shipping 45.2 million timepieces for the year. IDC sees Android Wear growing thanks to its use by tech companies, and traditional watch makers entering the smartwatch business. From 2015-2019, the platform will see the largest compounded growth rate at 80.5%. IDC estimates that Android Wear will account for 34.3 million smartwatch deliveries in 2019, good enough for 38.8% of the world-wide smartwatch market. Tizen is the dark horse of this race, according to the researcher, and could challenge Android Wear. Already, the OS is employed on the Samsung Gear S and Samsung Gear S2. Tizen will leapfrog over Pebble by 2019, with IDC expecting it to ship 2.5 million smartwatches that year. This will edge out the 2.3 million units that Pebble is predicted to ship in 2019. According to IDC's wearable research manager Ramon Llamas, the smartwatch of the future will be different than today's models. They will offer cellular connectivity, health sensors and a flourishing third-party app market. IDC sees smartwatch shipments soaring from 21.3 million units in 2015, rising to 32.3 million next year. By 2019, that figure will hit 88.3 million smartwatches shipped for a compounded growth rate of 42.8% from 2015 to 2019. This means its just bunk. IDC's prediction is saying that by the end of 2019 that 88.3 million wearables will be running the following OS's. Which does not include fit bit or other wearables. The other thing to take away from this is that this market is at its infancy, and anything can still happen. One thing it could mean, is people trust that brand, and feel comfortable with it. It's not always indicative of what's best. +1. It's a bit different in third world countries though. Apple shipped more. Not necessarily sold more. They started getting them (shipping to) in more stores. They even started to sell Apple watches in walmarts. But as far as actual sales, even Apple has not told anyone. Besides Apple is going to release another watch in less than 3 months from now. So the wise people will wait until then. GPS, usable WiFi, and more will be added in the next version. If the next Apple Watch is $349, it's not going to sell all that much better. The problem with the Apple Watch is its price. No more no less. It is not worth $349-$10,000. To have less features on a device brand new, less than what others had 3 years ago is stupid. Smartwatches to be are toys that many have found useful. For me its just the geek factor I like and I just love tech toys. I want the next new gadget. My Gear S was working perfect. I bought it so I wouldn't have to take my phone on bikes rides and still have my tunes wirelessly. I bought the Gear S2 because i liked it, not because i needed it. But the price will still bar many from entry. T-Mobile wants $360 for the cellular version. That is pricey for many. But that is still way more features than the Apple Watch has for nearly the same price. Pricey, useless features or to many features is another issues. Fitbit is doing well because they got in on the fitness craze where workout places are popping up like McDonald's. Single purpose device, does what a person needs, price is reasonable for it limitation. The Apple Watch IMO barely does more than a FitBit and look at its cost and the HRM doesn't even work properly. For something that costs maybe $50 to make, $349 is excessive and so is $360 (talkign to you Samsung/T-Mobile) But a wearbale phone for half the costs of a smartphone to me is a benefit even though very minor. Its more of a convenience. But at this costs, it isn't going to be for most. Apple and Samsung can ship as many as they want, but sales i think are never goign to be all that high considering most people stop wear watches in general. It's funny that your book basically mentions that if it remains $349 and up, it won't sell well. Lets look at the numbers. Apple will moved 13 million Apple watches in roughly 8 months. By the time it hits a year, it will probably be somewhere between 15-20 million. Now tell me what your definition of selling well is for a first gen product? Your have absolutely no idea how many watches they've sold, because they refuse to give a number. That's the most telling. Clearly shipping and selling are two separate things. Apple hasn't released any actual sales numbers. It's a known fact that Apple has been trying to push their watch in other sales channels. Apple even gave discounts of up to $100 for their watch. A really high discount on a new product. The other things to remember is this watch requires an iPhone for 3rd party apps. Even when it comes to data since Apples watch requires the iPhone to retrieve all the data. The current generation of the Apple watch cannot communicate with the outside world. This watches display is always off and it only gets 18 hours. That is from Apple themselves claiming that battery life. When I see other smart watches with their watch faces on constantly, with an option to turn then off and get 3 or more days. Plus Apples watch only works with Apple only. Pebble and Android Wear work with either Android or iOS. That's exactly what limits the appeal of the iWatch. Yes, the problem is obviously the price, which is why the Apple Watch outsold ALL other smart watches in 2015. When you launch a product and it immediately becomes the best seller in the segment, then I think you have it figured out. But please, pontificate some more about lower prices while other brands gather dust and the nascent Apple Watch keeps selling. No, you tool, it OUTSHIPPED other smartwatches in 2015; it didn't outsell them. Apple and retailers were predicting 50+m sales, so they locked-in contracts with retailers and manufacturers at that amount. It's selling less than 5% of that amount, but since Apple has already locked-in through contract, Apple is forced to buy the extra 47+m they haven't sold from manufacturers and then ship them to retailers. Retailers will eventually return them back to Apple and Apple will have to store them in warehouses, where they'll rot and Apple will have to write-them off. Right now, Apple is just trying to shove as many units to retail shelves as possible in order to fluff up their financial statements this year (Declining iPhone sales and profits will hurt their stocks badly). You can bet your bottom dollar that retailers will dramatically lower stocks of the next Apple watch. Right now, retailers have no choice but to keep buying the Apple Watch even if it's not selling because they're in a contract. Retailers are probably cursing Apple in private. I wonder if the high-volume of low-demand Apple Watches is what's causing retailer profit drops this year. LOL It's highly unlikely Apple has even sold more than 2 million Apple watches to consumers, else Apple would be talking about how they outsold everyone else. Really? have yet to see on eon anyone's wrists. Oh but Monday I will. We gave one away as a gift at out company Christmas party. This will be the first time I see one on someones wrist. You have yet to see one on a person's wrist? Do you live under a FU**ing rock? Do you live in the country by yourself? Do you have a job where you sit behind your desk all day? I'm in Chicago, and I see them on people's wrist on a daily basis. Because you see it on a daily basis doesn't mean it's absolutely everywhere in the nation. I haven't seen one on someone's wrist too. Did u even read the article? Shipments not SOLD! Apples sales are declining, thats why they changed from solds units they usually reports to shipments to cover it up. As novel as I see smartwatches being, I can see why Apple would be the first pick among the catalog of choices. Samsung would be a close second contender. I thought Android Wear only sold 700k? This. I'm quite happy with 4.7" and can stretch to 5 if I have to. This why I bought the watch I used to have to pull out my 6s plus every 5 seconds to see who text and email now I just look at my watch and done, if it's important I'll pull out my phone if it's not just dismiss on my watch. I'm loving this thing. Yes sir. I use it for this as well as the fitness tracking and complications. Haters keep saying smartwatches are useless and don't do anything your phone doesn't do. They don't get it. The bottom line is that it replaces your dumb watch that does nothing but tell time and it replaces those rubberband looking fitness trackers that look absolutely terrible. 2 Years later, the screen of smartwatches will get larger tio. I expect them to be 3 inches. The problem with this is that you are expecting to use the watch as a phone. That is not how you use it. You will not be browsing the web and watching movies on your watch my friend. It mostly provides at a glance info and fitness tracking. If you need 3 inches or more, that's when you pull out your phone.